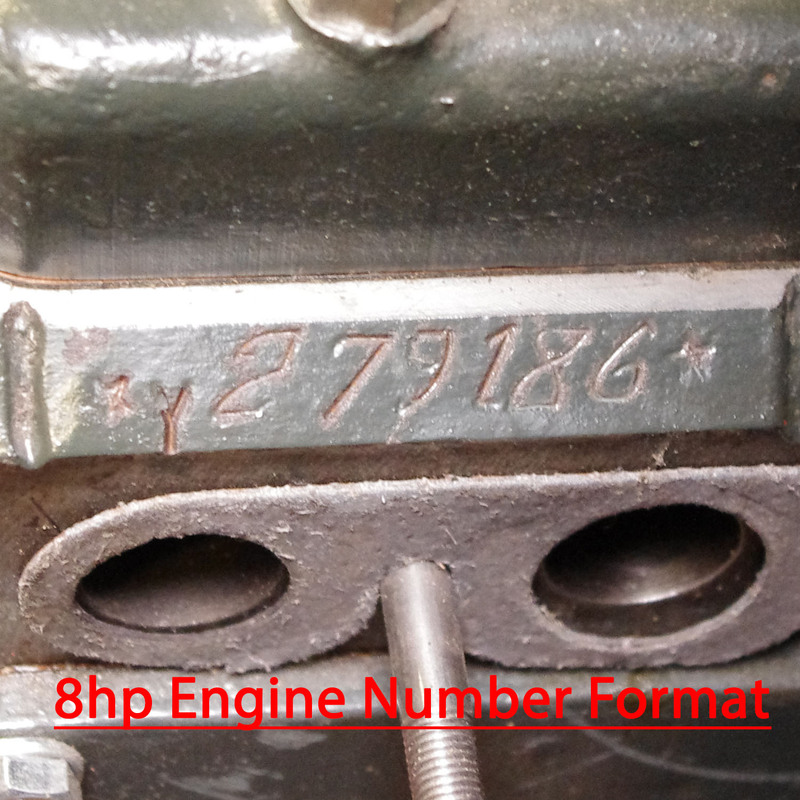 The chassis number of the small side valve models produced by the Ford Motor Company, England, always corresponded with the original engine's number. At the time of manufacture this as stamped on to the frame, and sometimes also marked on a printed commission plate riveted to the vehicle. The body build number is on the Brigg's plate, a stamped brass or alloy tag, affixed by two small screws. Australian build models usually had the body number stamped on the bulkhead, either on the front (post-War models) or side (pre-War models) of the toolbox. Since our specialist fields are the 8hp, 10hp and 100E UK built models, the majority of which are right hand drive (rhd), we will make all our references to these, however we will detail left hand drive (lhd) variations where known. 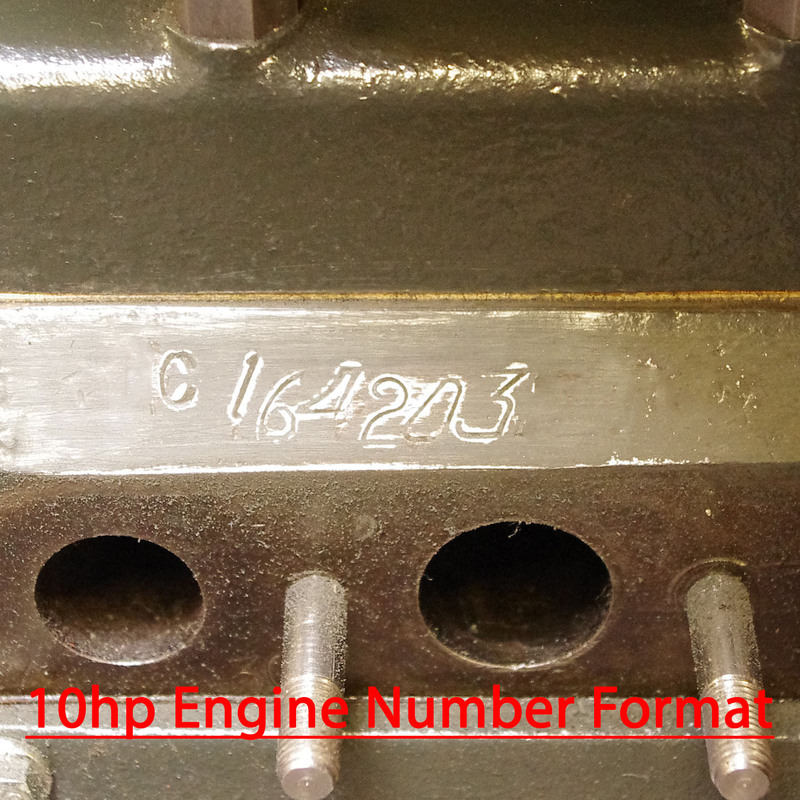 You will find the number of the existing engine as this is usually stamped into the side of the block on the front left side, on a chamfered ledge, just under the cylinder head. On later 100E units it is on the front right side above the generator mounting bracket on a flat area. Ignore all cast in numbers as these are part numbers, and not necessarily the finished part identity. The digits are very fleet and have a distinct leaning character. The format is always Y followed by numerals for 8hp units, C for 10hp models, 100E for 100E/300E models and 105E for 107E models. If it is preceded by the letter R the unit fitted now is a factory supplied replacement unit. Most post 1937 built vehicles had a square or later diamond shaped printed plate, headed 'A Ford Product', riveted at all corners, affixed to the body, on which vehicle details were stamped. The upper of the two, marked 'engine no', has the details of the original engine's number which was fitted at the factory stamped in. This is the data that we now refer to as the 'chassis or VIN number'. Do not despair if this does not now match the number of the engine now fitted, a well used vehicle could have received several exchange units during it's working life. The lower marked 'model no' is stamped with the actual vehicle model number. On Upright models this was usually fastened to the vertical surface of the passenger's side of the bulkhead in the engine compartment, or to the tool box lid. 100E and 107E models had the plate fastened to the inner wing on the driver's side of the engine bay, readable by standing beside the vehicle and looking down on to the plate. At the time of manufacture/assembly all vehicles were marked on the chassis frame or later body, with the original engine's number, and locating this can involve a certain amount of very careful examination. 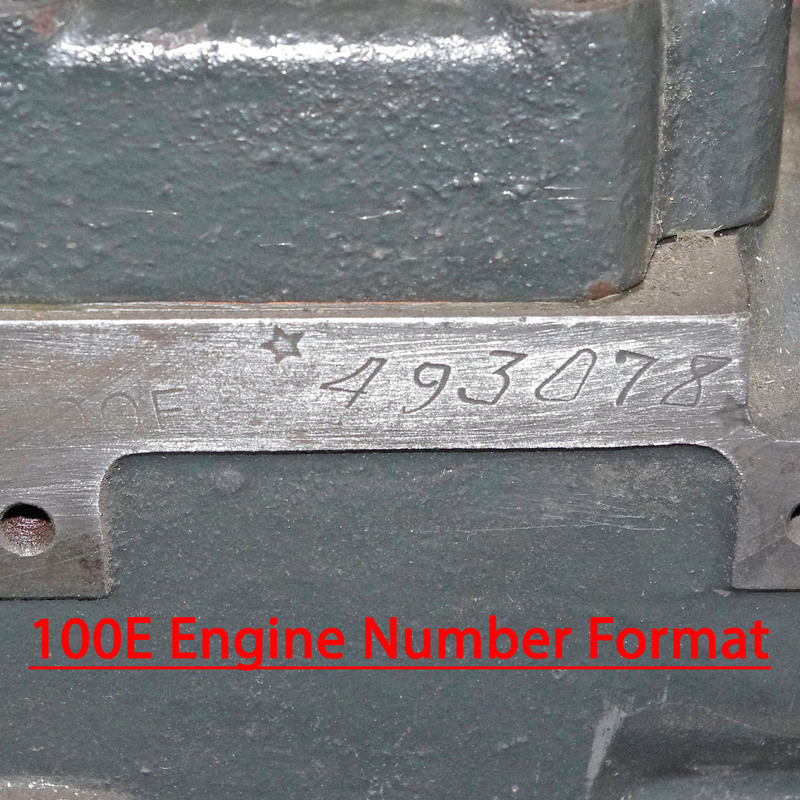 Please remember that this is the 'original engine's number' as factory fitted. Upright models, including Model Y through 103E all had the number stamped into the flat horizontal surface of the main right hand chassis side rail (left side for lhd), just ahead or beside the cross member rivets of the diagonal brace, just to the rear of the steering box. The distinctive leaning characters are sometimes preceded by a star, then Y for 8hp, C for 10hp, then the numerals, sometimes finishing with a star. This can be read by standing beside the vehicle and once the bonnet is lifted, looking down to the chassis rail. 100E and 107E models usually had the number stamped around the plate, which is held in place by three nuts, which forms the suspension unit upper mounting on the driver's side in the engine bay. The data on this plate (numbers and letters) designated the actual body build only, designating body type, right or left hand drive etc. It does not form any part of the data required for the chassis number. On pre 1937 cars it was usually fastened to the cross member in front of the passenger seat, or to the bulkhead below the battery box, or on the near side of the toolbox. On most post 1937 Upright models the plate was fastened to the top of the bulkhead. On E83W models it was fastened to the top of the inner wing, on the drivers side, underneath the corner of the bonnet. On 100E/300E/107E models it was fastened to the horizontal shelf at the back of the engine bay. We have collated the following data to assist in establishing the probable age of vehicles. The actual engine build number will indicate the first chassis number for the period. Please note that this should only act as a guide, and is listed for information purposes only.